The last time I was in Russia, it was not really Russia—it was still the USSR. Returning now, some 13 years later, was an entirely different experience. I just returned from a trip that I’ve been planning for two years. The chorus I sing with, Pacific Sound, was the official chorus representing SPEBSQSA at the Fourth International Barbershop Harmony festival in St. Petersburg. My main observation is: WOW! The place is entirely different now that people aren’t living under the pall of communism. 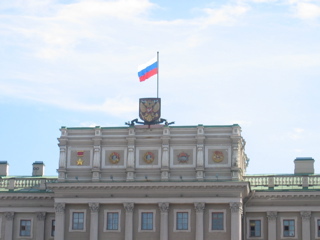 It was so refreshing to see the white-blue-red flag of the Russian Republic flying over buildings rather than the red hammer and sickle. It’s nice seeing the double-headed eagle and noting how the people here are beginning to understand and recover from 70 years of the worst repression you could think of. There’s still some lingering flavor of totalitarianism—like that fact that policemen stand on the sides of streets and when they point at a motorist with their baton, the car immediately pulls over and the driver gets out his wallet—but things are so much more pleasant. It’s hard for me to believe that about 15 years ago, we were set to blow each other to smithereens with nuclear weapons. I couldn’t imagine ever doing that now. I know that there are still troubles there, like the incredible pressures and difficulties of converting to a market economy. A popular saying among Russians is that “Under communism, we had plenty of money but nothing to buy; now, there’s plenty to buy but no money”. For the western tourist, Russia can be an incredible bargain and there are some wonderful things to purchase as souvenirs. Sadly, many Russians can’t afford the basics leading to things like people leaving their children at state orphanages not because they don’t want or love them, but because they can’t afford to support and feed them. Our tour guides told us that a maid in a hotel might make around $50.00 per month—a medical doctor makes around $200.00 a month. It’s all relative, though (it costs about 20 cents to ride the subway anywhere in town and a liter of bottled water is about 35 cents) but it doesn’t necessarily make things immediately affordable. We even went to—of all places—a gay bar in St. Petersburg. It was small, kind of dingy and really smoky, but it was there. The patrons were attractive and having a good time. It was awesome not for those facts, but for the realization that what they were doing was totally illegal under communism—these fun-loving, attractive patrons would have been earning themselves a one-way ticket to the nearest Siberian gulag. With all the bickering and annoyance and infighting and haughty self-righteousness of people like the French and Germans, not to say all the “entangling alliances” and interventions we’ve made all over the world, I can’t help but wish we’d just forget about everyone else on the rest of the planet, ally ourselves with the Russian Federation and tell the rest of them to go to hell. There’d be no stopping us, and we’d make the best friends we could ever possibly have among the great Russian people. This entry was posted in Europe, observations by dpkworldwide. Bookmark the permalink.